Okay well I have to admit that I feel honored to be posting my very first tip of the day. 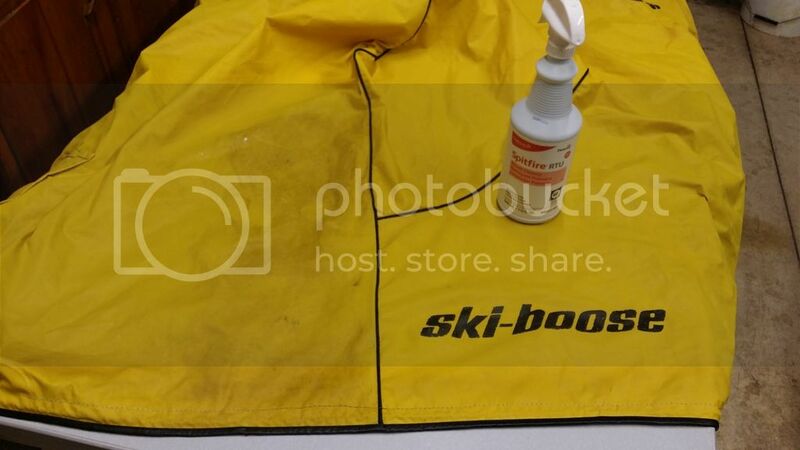 I have been out in my garage cleaning up one of my old covers that luckily happened to be included in the 1970 Ski Boose Mark I deal that I picked up a few years ago. It has been in a box since I brought it home and I have been wanting to get it cleaned up. I tried a few different products and then stumbled across this one that seems to work pretty good. What is everybody else using to clean those old vintage covers to bring them back to their original Glory? I tried dish soap, Windex, laundry detergent. I wanted to go easy on it because I did not want to damage it. Let's be serious this cover is coming close to 50 years old. I do know that certain chemicals can be too aggressive and I don't want to dry out this old cover. It still is quite pliable. I am certainly in no way endorsing this product. But for me it is working quite well and I thought I would share it with all of you guys. Since photobucket took away your picture, what product did you use? The cleaning product I used is called Spitfire RTU. The cover I used it on was the 1970s plastic type. Not sure I would try it on cloth. If you decide to try it, use it with care on both the cover and your hands. It can be harsh in nature as it is on the caustic side of the pH scale. Start slow. What cover are ya thinking about cleaning?